Akron Web Designers provides complete turn key solutions for any business or industry. We cater to all industries and have a solution to fit every need. From web design, development, marketing, to mobile applications we’ve got you covered. Why deal with multiple companies when you can hire one to do it all. We employ some of the best in the industry and provide value, integrity and results in every service we provide. So whether its networking a small or large office or getting your website to rank for better traffic we can help. Pick up the phone today and see how Akron Website Design can help your business grow. We design and develop websites based on the client’s needs. We have various options available to suit the needs of any business. We can provide custom designs and layouts with robust database function or a simple informational website that displays hours, locations and contact info. We have also developed various business packages that are designed for start ups and businesses that are on a tight budget.However, whatever your needs are we can help. Starting an online business has never been easier. The experts at Upstart Web Design has done the work for you by compiling all of the tools you need to sell online into one search engine friendly shopping cart software solution. 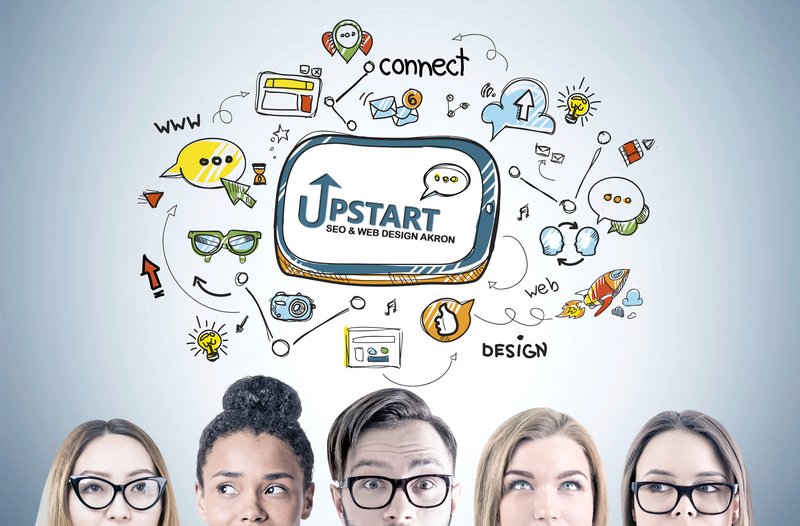 Upstart Web Design’s user-friendly e-commerce software gives you the power to start, grow and manage your online business with ease. Is the goal to sell product or service, educate, or collect data? A positive customer experience is vital to conversion, no matter what your conversion goals may be. Our award-winning designers and developers will create a positive experience to maximize your conversions and deliver the optimal return on your investment. We strive to find the perfect balance between the web site’s design and functionality. In the fast high demand business environment where customers, employees, vendors and supplier interaction is crucial your business needs to provide these parties a seamless solutions to collaborate the business process. Form sales, to employee management to order processing and everything in between having the tools to successful implement these business functions in a automated environment can be the deference between your next big client and the competition steeling your market share. Upstart Web Design employs some of the best graphics designers in the business. We can handle any graphic design needs such as; logo design, banners, brochures, signs, web design and more. Upstart Web Design has a total solutions package to meet your business needs, from your website to your stationery, business cards and more. Call and discuss how we can brand your company with a unique label that stands out. Whether you have a site that needs to be maintained and monitored, hosting, or need a new website and feel you will need someone to get the most results from it, look no further. We are a complete web design firm that provides solutions to meet any business need. Search engine monitoring and maintenance, e-commerce management, or just need to make simple changes a few times a month we can handle it. PRO WEB DESIGNERS provides award winning hosting solutions for any business website site. Dedicated servers, shared hosing, VPS, 24/7 support, free applications and more. Our server technology is rated as one of the best in the world. We have servers located in Dallas, Arizona, California and New York. Whatever your hosting needs are, Upstart Web Design can meet those needs.